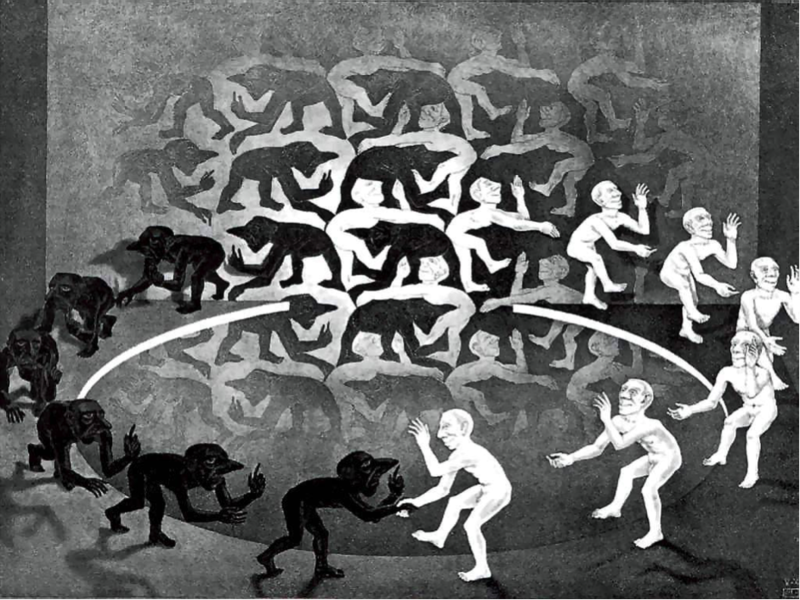 MC Escher’s work is valued for its complexity, and its representations of infinity. But a look at his life shows his deep debt to Islamic art. For Christopher Jackson, this prompts reflections about the way in which East and West have always inspired one another – and why we must fight for a world where this continues. It isn’t an image you forget in a hurry. On a far wall, like a cinema screen, we see tessellated figures, some black, some white. The long noses of the black figures form the borders of the indented stomachs of the white. They look like cartoonish cave art, as if the Lascaux caves had been drawn by Hieronymus Bosch: primitive decoration made humorous. But as the eye strays to the lower part of the mêlée, we see that the representations are no longer representations: at a certain point the figures have climbed out of the wall and into the animate world. They are moving around in a circle. The black figures – or it may be that we are seeing the staggered approach of one figure because they all look the same – each move forward with a pessimistic finger raised. Their white counterparts hop in the opposite direction, each with an optimistic hand extended. In the centre, two figures – one black, one white – meet. They shake hands. This picture is called Encounter. It was made by MC Escher in 1940, at around the midpoint in his career. It may be construed as a meeting of two types – the optimist and the pessimist. The white figures seem to dance and jape light-heartedly; the black ones creep warily, as if doubting that good can come out of any encounter. In another sense it might be considered an image of a larger meeting – of two civilisations. I say this because the superb exhibition now showing at the Dulwich Picture Gallery shows unequivocally that Escher’s art was fed time and time again by an encounter of his own – with Islamic art. Born in 1898 in the Dutch province of Friesland, the influence of Islamic art on Escher’s magnificent body of woodcuts, lithographs, and mezzotints can in one sense be overstated. Escher had already shown an interest in tessellation – or to use his preferred phrase ‘regular division of the plane’ – before his trip to Alhambra in 1922. By then he had already produced his Eight Heads (1922), in which a serious of faces are sinuously interlinked. But sometimes a young artist, in search of confidence, needs the vindication that can only come from the past. Escher first visited the great Moorish palace in the centre of the southern Spanish city of Grenada in October 1922, during a long sojourn through Spain. The sight of it confirmed him in his course – and also spurred him to a deeper commitment to tessellation. On 20th October he copied a set of wall tiles, compressing tiles which measure one metre square in the Alhambra into a far smaller space. We must imagine the young artist looking up at those Islamic tiles, and finding that something like his own tendency of art had already been arrived at, in enlarged form, by the Moor craftsmen of the past. What was this tendency? Escher was attracted to arrangements of shapes which grow seamlessly out of each other. 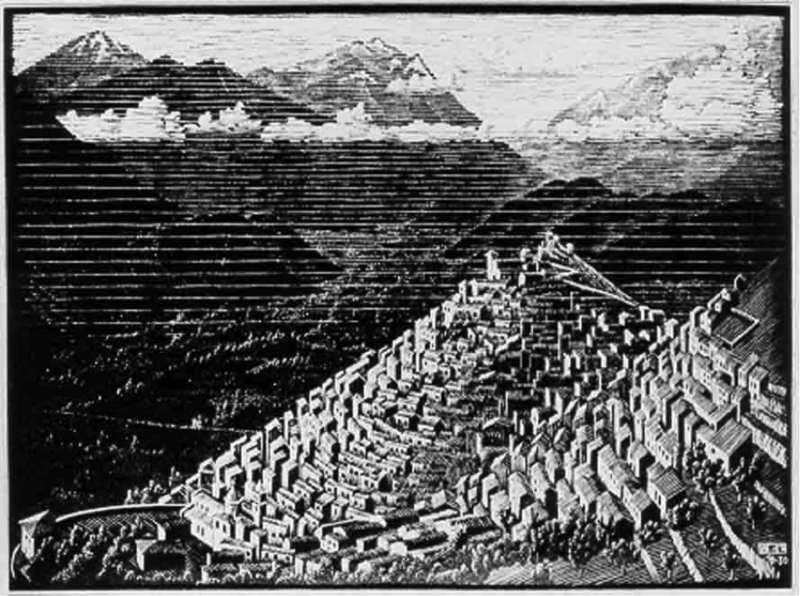 In Escher’s woodcuts and drawings – as in the Grenada tiles – the outer contour of one object coincides exactly with the contour of the object adjacent. It might be a pattern, or a group of reptiles or the roofs of houses. It is primarily a logical art. The material world after all is teeming but isn’t chaotic: it fits together. Islamic art has a long and rich tradition of celebrating this in abstraction. The more complex the pattern, the more suggestive art can become of infinity. Infinity. From the beginning Islam’s image of Allah was bound up with the pure notion of endlessness. Islam’s original attraction in fact, may have had something to do with its comparative simplicity, when set against the fiddly notion of the Christian Trinity. The idea of Tawheed, or the indivisible oneness of God, as well as Mizan, which roughly translates as ‘order and balance’, do not in fact preclude a multipersonal God. But the complexity of God hasn’t taken human form, so that Islam might be said to lack the doctrinal difficulty of the idea of God made flesh which has always been a thorny issue for the Christian. This is the reason why Allah has rarely been depicted: the Sistine ceiling where Adam, made in God’s image, calmly reclines to receive the gift of life from a like-imaged God, would never have been necessary in Islam because Islam doesn’t present that kind of theological difficulty. Christianity, in needing to unravel the controversy surrounding Jesus’ nature, turned to the figure as means of carrying on a kind of argument with itself. In Renaissance art the questions are always being asked: What is the nature of God? What is the nature of the man? In Western art, the transcendent has always been bound up with the face. This created, in Michelangelo, Leonardo and Raphael, work of real spiritual power. But it might be said that once the high point of the Renaissance had passed, and the excesses of the Baroque had risen out of the Counter-Reformation, transcendent art disappeared in the West in favour of an enlightenment art which is more likely to create admiration than veneration. Which brings us to one of the great untold stories of modern art. In Mondrian, in Agnes Martin, in Rothko, in Ben Nicholson, and in MC Escher, we find again and again, the division of the canvas. A transcendence has been reclaimed which is essentially based on Islamic ideas. In 2010’s Enfoldment and Infinity, Laura Marks traces the similarities between post-modernist and Muslim ideas of the transcendent. For Marks, Islamic art has never gone away. Geometric forms expressed Islamic artists’ fascination with mathematics as a metaphor for divine order and presence. The 20th century – as the Renaissance had done in its different way – simply rediscovered what it needed. As you travel through the marvellous rooms of the Dulwich exhibition, you find this theme repeated. All that followed after Escher’s first sight of the Alhambra, has something of the experience of Alhambra in it. There are the wonderful Italian landscapes such as South Italian Landscape (1929), where the ranged buildings kiss one another and seem somehow of a piece with the receding mountains. Even better is Morano, Calabria (1930), (pictured) where we see the surface divided horizontally: everything here partakes of a deep unity and order – a Muslim might say, of ‘Tawheed’ and ‘Mizan’. But it was Escher’s second visit to Spain, where he revisited the Alhambra as well as experiencing La Mezquita in Cordoba, that appears to have really disciplined his art. From that point on, tessellation is insisted upon more rigorously – but at the same time, it is also treated playfully. In Reptiles (1943), we see a tessellation coming to life. 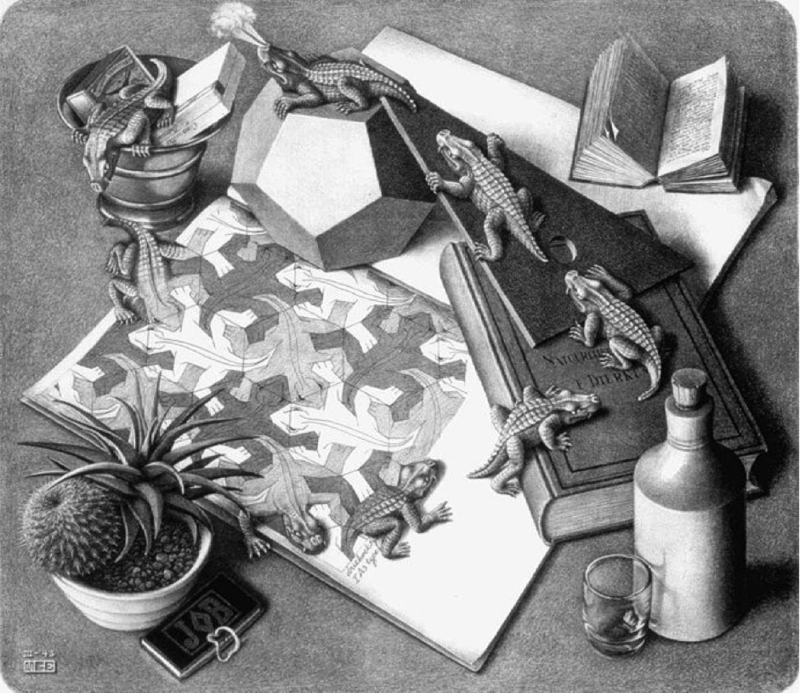 In this marvellous lithograph, there is an open book displaying one of Escher’s reptile tessellations. In the picture, the tessellations are precise but the majority of the reptiles are two-dimensional. But then we see in the bottom left hand corner that the reptiles – like the black and white men in Encounter – are climbing out of the surface. They are no longer mere shapes, but actual lizards. What is occurring here is another encounter, another meeting of civilisations. The Judaeo-Christian conception of God had always insisted on dynamism and change. The Greeks celebrated above all movement and process. We can see the live billows of the drapery on the Elgin marbles. We know that Myron’s discus-thrower will throw that discus and that the world will be in motion again. Ovid had written an entire epic, Metamorphoses, celebrating the notion of change. Likewise, the Christian God insists on activity. Jesus after all is busy in the world, and the church expects the Christian to do likewise. The emphasis in Christian tradition on the process of reading the Bible, and communing with it, is distinct from the idea of the uncreatedness of the Quran. But here, in a lithograph, we see the two traditions given coexistence. The tessellations of the Alhambra are given Western dynamism. It is powerful stuff: the decorations of Islamic art lose their static nature at the exact moment that the slackness that had crept into Western literal art is disciplined by precision. The world has seen golden eras of cooperation between Islam and Christianity. Averroes brought Aristotle back to European notice. The image of medieval Cordoba, where Jew, Christian and Muslim lived peacefully alongside one another, is surely an attractive one. We share a common experience of shape and sound and sensation. Our theological differences are also small. For instance, I wrote above about the uncreatedness of the Quran and called it distinct from our ideas of Western scripture. But the John Gospel opens with the famous line: ‘In the beginning was the Word.’ We are never very far from reasons for friendship. But if the world has seen eras where that friendship seemed possible, we are frequently confronted by images which suggest that this isn’t one of them. In 2014, the media began reporting the destruction of cultural heritage by Islamic State in Iraq, Syria and Libya. In Iraq, mosques and shrines – not all of them Shiite, as one might expect – were destroyed. For instance, the Tomb of the Girl, said to honour a girl who died of a broken heart, was more likely the tomb of the medieval Sunni scholar Ali ibn al-Athir, and is now no more. To feel the madness of this isn’t difficult – it is most people’s natural response. But walking through the rooms of the Escher show, the viewer gets tantalising glimpses of a saner world, where ideas are freely shared and, by being shared, fuse into other forms. In the last rooms, mathematics becomes the dominant note, partly due to Escher’s friendship with the British mathematician Roger Penrose. These are the rooms which give us some of Escher’s most famous works including Waterfall and his last work, Snakes. The emergence of mathematics as a theme in MC Escher’s work is all of a piece with his attraction to Islamic art. It was the medieval Islamic world which oversaw the development of decimal fractions and the first systematised study of algebra. So that by the end of the exhibition, we have been given an image of a world unlike ours, but which might be ours, where there is fruitful dialogue – between East and West, and between art and science. Escher probably never intended to do more than express his remarkable imagination, but in doing so, he created fine images of intellectual freedom. In other words, this is an exhibition which not only thrills the mind, but also makes the heart yearn. And it also provides you with an image of that yearning. This is Metamorphosis II, made in 1939-40. It is about twelve feet long. If read from left to right, we find the following: the word metamorphosis, written as if in a game of scrabble becomes a series of chessboard squares; these squares turn in time to insects and then to birds. Eventually the birds undergo their own metamorphosis into squares. These squares become the roofs of houses; these roofs turn into Atrani in southern Italy. But there Escher was left with a problem. Atrani is a coastal town: what can it become except the sea? But there are times in art when genius knows the best thing is to do something decisively radical. In Persuasion, Jane Austen shuffles the pack of her characters by having Louisa Musgrove fall, quite out of the blue, down some stairs. Beethoven changes key in one symphony by blasting a top note of A in the brass, which challenges and wills all the other instruments to follow it. Escher does something similar here. He invents a bridge climbing out of the Amalfi coastline which becomes a medieval watchtower. The watchtower becomes a chess rook, and from there the image is free to roll on to its completion. That bridge might be many things – a charming but improbable architectural detail, a cunning piece of design. But in the context of this superb exhibition, it feels like a bridge which asks for peace between culture, and all the ensuing pleasures of influence that such a peace would bring. MS Escher was at the Dulwich Picture Gallery in January 2016. Christopher Jackson is a freelance writer based in London.